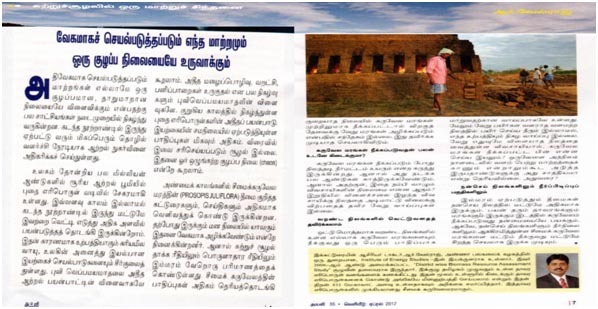 Agni: A leading Technical Tamil Magazine: Published an article on the impact of the removal of Prosopis juliflora, a tree which will absorb the ground table water – an important issue in Tamil Nadu. The 32nd Indian Engineering Congress organized by the Institution of Engineers (IEI), Tamilnadu State Centre in Chennai, on December 21-23 was largely attended. The 3-day Conference and symposium witnessed paper presentations and enlightened speeches by various chapters of the Institution as part of the technical sessions.Addressing the gathering, Hon’ble Banwarilal Purohit,Tamil Nadu Governor, said that the deliberations at the technical sessions would surely have generated more awareness and promoted newer ideas for greater innovation and creativity in various engineering disciplines. The valedictory session was addressed by Hon’ble. Ram Nath Kovind, President of India, who said the topics selected for discussion were of great relevance today, and the emerging innovative techniques and trends would positively help the society to advance further. This Congress would also provide opportunities to the delegates to exchange their views and ideas with the objective of involving the student community in making higher technological achievements. Dr. G. Ranganath, Principal, Adhiyamaan College of Engineering, and Chairman, IEI, Tamil Nadu State Centre, Chennai, Er. T.M. Gunaraja, Co-Chairman, Er. R. Ramdoss, Honorary Secretary, IEI, Dr. R. Velraj, Professor& Director, Institute for Energy Studies, Anna University, and IEI, Chennai Chapter, Dr. P. Rajamani, Head of IEI - Madurai Chapter, and Dr. R. Selvaraj, BHEL, and Head of IEI, Trichy Chapter, together worked hard to make the 3-day event in Chennai a grand success. After Nearly Two years, the country’s ambitious basic science project – India-based Neutrino Observatory (INO) seems to be moving forward after the Tamil Nadu Pollution Control Board (TNPCB) proposed to form a six-member expert technical committee to look into the matter. The TNPCB counsel Yasmeen Ali submitted the names of six expert members – R Velraj, Professor and Director, Institute of Energy Studies; A Pandurangan, head, department of chemistry, Anna University; M Suresh Gandhi, Department of Geology, and K Sivaji, Department of Nuclear Physics, University of Madras; Nehru Kumar Vaithilingam, director, Centre for Environmental, Health and Safety, Annamalai University; and S Balaji, former chief conservator of forest and former member-secretary of State Forest Commission. The committee will be coordinated by D Sekar, additional chief environmental engineer, TNPCB. Dr. R. Velraj, Director of the institute of energy studies, Anna University, said the solar sector cannot grow without adequate manpower. “University courses and curriculum do not meet the specific skill requirement of the renewable energy industry. The curriculum must focus on technology and design. Also, the institutions should provide extensive training and exposure on latest trends and technologies,” he said. The professor said Anna University was the first university in the country to start M.E. Solar Energy programme in 2010. Across the country, over 50 institutes are offering master level programme on Solar and about 1,000 students are benefiting, he said, pointing to the shortage of skilled ITI-trained candidates who have exposure to renewable energy. “The syllabus of ITI needs to be revisited to strengthen and build awareness on RE,” he said. “We have partnered with TEDA and private companies to hold training programmes for academicians, engineers and technicians. On this experience, we are planning to train trainers in the next one year,” he said. Anna University has been identified as one of the partners for solar energy training network which plans to train 4.25 Lakh qualified and skilled manpower in solar energy sector, he said. A senior TEDA official said manpower requirement for setting up solar plant, utility or rooftop is largely a combination of fabrication, electrical and masonry skills. “For ITI students with electrical background, the skill up-gradation needed is minimal and can be through on-the-job training. However, at project management level, there is a growing need for qualified manpower as it requires specialized knowledge and training,” he added. The synergies inherent in combining India’s scientific strengths and the United States’ technical know-how are something that can bring significant progress in the development of frontline technology in solar energy, according to speakers at a Indo-US workshop on the subject, in the city on Monday. Speaking at the ‘Indo US workshop on Advances in Solar Energy and Utilization — Fast Forward with Solar Mission’ held at the Anna University’s Vivekananda Auditorium, David S Ginley, Research Fellow and Group Manager at the National Renewable Energy Laboratory, Denver, USA, told the students who had gathered here, that a collaboration between the two countries in the development of Photovoltaic Cells was on track already and had the potential for more. The workshop was also attended by several prominent persons in the field of renewable energy, including Sudeep Jain, Chairman & Managing Director of Tamil Nadu Energy Development Agency, William Tumas, Associate Lab Director, NREL, R Murari, Advisor to the president FICCI, S Ganesan, Registrar of Anna University and R Velraj, Director, Institute for Energy Studies, Anna University. Director of the Department of Energy, Anna University Dr. Velraj said India gives great importance to cooperation with Russia and has high expectations for the NPP Kudankulam. He also pointed out the actuality of the exhibition on the eve of the start of the first power-generating unit and insisted on the importance of provision to people information about modern technologies used in Kudankulam project, its environmental compatibility and safety systems. To overcome power challenges faced by the rural population, the Anna University (AU) is leading a research project, where villages can completely switch over to renewable sources of energy without any power cuts or disruptions. Joining hands with AU are Madras University, Alagappa University and Bharathidasan University. Shortly, there would be a technology demonstration in one of the villages in the State, said Director of the Institute of Energy Studies R Velraj, who is also the principal investigator of the project. The project focuses on generating cool energy that will be stored. The source of power would be solar and wind energy. Besides electrifying homes and offices, the energy generated can be used to preserve dairy and food products in villages where air-conditioning facilities are inadequate. The official said that in recent years there was a boom for renewable energy, but solar and wind energy are intermittent. There is a mismatch between demand and supply. “There is a need for energy storage and if we can promote decentralized power resources in village side, it would help both in job opportunities and industrial activities,” he said. Velraj said in order to overcome the present energy challenges, smart technological solutions are the need of the hour. A project titled “Sustainable energy technologies- efficient renewable power generation with energy storage for sustainable smart grid” was submitted to the Ministry of Human Resources Department (MHRD) under research and innovation scheme in December last year. The Project Approval Board (PAB) of MHRD has sanctioned a grant of `15 Crore. The project is in line with Providing Urban Amenities to Rural Areas (PURA) and Tamil Nadu’s strategic plan for infrastructure development for greener tomorrow. “The major objective of this project is to maximise the share of renewable energy (solar, wind, bio energy) in total power generation and reduce the barriers in the integration of new storage technologies,” he said. Small villages can generate locally 0.5 MW to 5 MW, Velraj said. This can be further fed into the grid. Power can be generated in the open terrace. Explaining the micro grid concept, he said, “This project is focusing on generating power in villages so that micro grid concept can be adapted. We can generate power from solar and wind and this can be transferred to all houses and offices of the villages through the local transmission line called micro grid. Thereby we can introduce energy storage concept and be independent of TANGEDCO. ”To a query, Velraj said they are yet to identify the village, where the technology will be adopted and demonstrated. He said the first instalment of `7.5 crore had already been allotted out of the total `15 crore for this research project. CHENNAI: Several colleges are increasing their installation capacity of solar power plants to cut down on the electricity bills. Already, many educational institutions have units generating 20 Kilo Watt (KW) to 100 KW, and now they are going to 500 KW units. Institutions like Anna University (AU), Madras Medical College (MCC), MOP Vaishnav College, D G Vaishnav College, Vivekananda College, Jerusalem Engineering College, and Mohammad Sathak AJ College of Engineering on OMR are using solar power. Anna University installed small-capacity solar power generation plant in 2013. Currently, the three colleges affiliated to the AU, including College of Engineering, Guindy, Madras Institute of Technology (MIT) and AC Tech, generate 34 KW daily. The CEG alone generates 20 KW bringing down the combined electricity bill by Rs 30,000 per month in these institutions, said R Velraj, Director, Institute for Energy Studies. Now, the AU took a decision to go for bigger solar power plants. The university is going to install large power plants in the College of Engineering, Guindy, which will generate 500 KW solar power. “While large solar power plant will be installed in CEG, Rs 1 Crore is allotted for solar streetlight, sanctioned by the MHRD, of which half will be installed in CEG and half in MIT,” he said. He also added that under another Tamil Nadu Govt scheme, 100 KW solar installation will be done in MIT and 150 KW in AC Tech. Under the same scheme 18 colleges under Anna University will have 50 KW solar power plant, which is also approved by the government. With concern for non-availability of potable drinking water growing, researchers at Anna University have come up with a smart solution to address the issue using domestic goods like a refrigerator and air conditioner. They claim that drinking water can be produced using heat from solar Photovoltaic (PV) operated Vapor Compression Refrigeration (VCR) system or AC following the simple logic of evaporation and condensation. R Velraj, Director, Institute for Energy Studies, Anna University, said the heat that is pumped out to the atmosphere by the evaporator in one tonne AC machine can be utilized to generate 20 litres of water per day. Velraj and his team submitted the project proposal titled ‘Desalination through ,nhhhwaste heat recovery from solar PV operated VCR system’ to the Department of Science and Technology and a grant of ` 35 lakh has been provided for the project .